The Pacific Ocean is so vast that it hosts three separate and distinct annual tropical cyclone seasons to the north of the equator: (1) the East Pacific Hurricane Season, (2) the Central Pacific Hurricane Season, and (3) the Northwest Pacific Typhoon Season also referred to as the West Pacific Typhoon season. The Northwest Pacific Hurricane Season includes all tropical cyclones generated in the quadrant north of the equator between LON 100 E and the 180 Meridian and it is by far, on the basis of the historical record, the most active of all three northern hemisphere cyclogenesis basins in the Pacific Ocean. 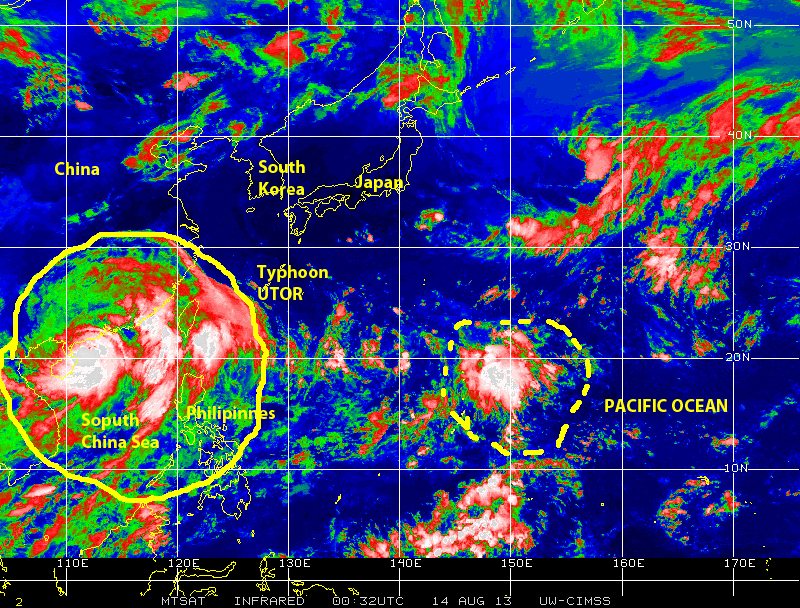 Super-Typhoon USAGI has been the strongest storm of the 2013 Northwest Pacific season thus far. USAGI originated from a tropical wave in the Philippines Sea that gave way to a tropical depression on 16 September with winds of 36.8 kilometers/hours (kph) and a minimum central pressure of 1002 hPA. This system encountered a rather favorable ocean-atmosphere environment strengthening rather quickly into a tropical storm and reaching typhoon strength approximately 24 hours later. By 19 September USAGI had reached major tropical cyclone strength (based on the Safir-Simpson Scale for hurricane classification) with maximum sustained winds of 195 kph (121.9 mph). Less than 24 hours later, on 20 September, USAGI became a super-typhoon when its central pressure dropped to 918 hPA and its maximum sustained surface winds reached 256+ kph (160 mph) for a brief period that day. On 22 September USAGI, still a major typhoon, made landfall near Shanwei, China near and to the northeast of Hong Kong. Satellite image (courtesy of NASA) of 22 September 2013 showing Typhoon USAGI as it made landfall in China near Hong Kong with soon-to-reach typhoon strength PABUK in the Philippines Sea. 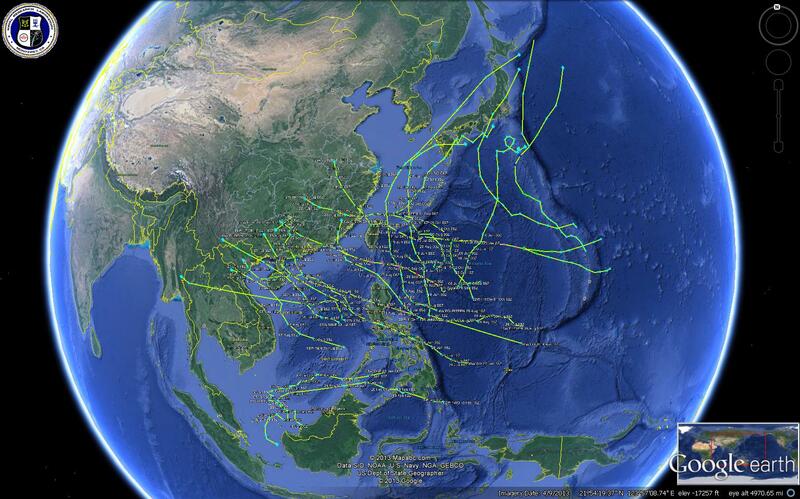 Other major typhoons in the Northwest Pacific basins in 2013 were SOULIK , which reached maximum sustained winds of 230 kph (145 mph) and a low central pressure of 929 hPA on 10 July before continuing on toward a landfall near Yilan, Taiwan on 12 July and a second landfall near Fuzhou, China on 13 July 2013. And UTOR, which reached maximum sustained winds of 240 kph (150 mph) and minimum central pressure of 926 hPA, a rather strong category 4 storm, before making landfall in the Calguran Peninsula near Dinalungan, the Philippines, on 11 August. UTOR continues on toward the west over the South China Sea where it re-strengthened before making another landfall, this one near Hailing-Dao, China on 14 August. Satellite image (courtesy of NASA) showing major Typhoon UTOR on 13 August 2013 after hiting the Philippines on its way to another landfall near Hailing-Dao, China still as a major storm. Typhoon activity in the Northwest Pacific basin has increased considerably over the past two weeks, since 20 September, with a total of six-named tropical cyclones and one tropical depression generated during this short period. 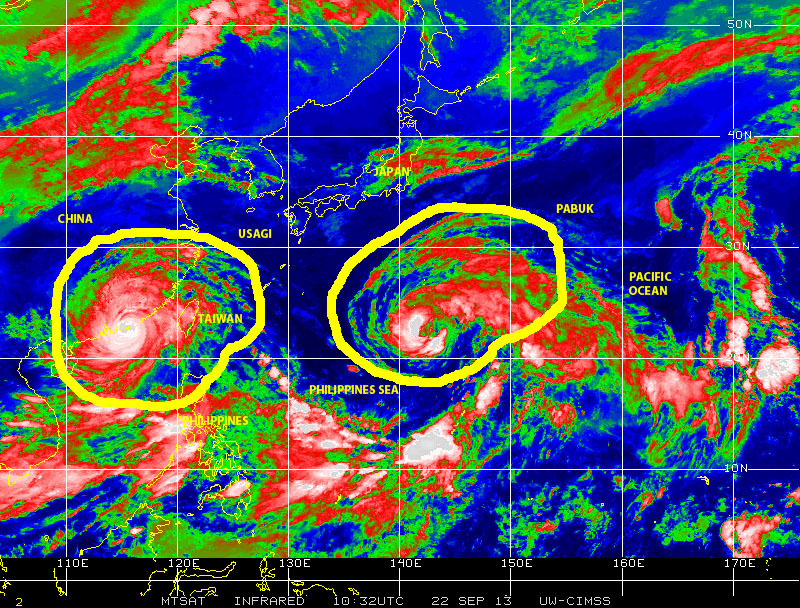 Four of these storms reached typhoon strength including already mentioned Super-Typhoon USAGI. This increased activity has so far produced four instances of two storms active in the basin at the same time USAGI and PABUK, PABUK and WUTIP, SEPAT and FITOW, and another pair that is still active on 5 October FITOW and DANAS. The Eastern Pacific Hurricane Basin, also known as Northeastern Pacific Basin, extends north of the equator from east of LON 149 W to the coastline of the Americas. The 2013 hurricane season, which in this basin runs from 15 May to November 30, has as of 5 October generated 13-named tropical cyclones including six hurricanes and seven tropical storms. So far, no major hurricanes. The Central Pacific Basin, ranges north of the equator from west of LON 140W to the 189 Meridian, has an annual hurricane season that runs from 1 June through November 30. 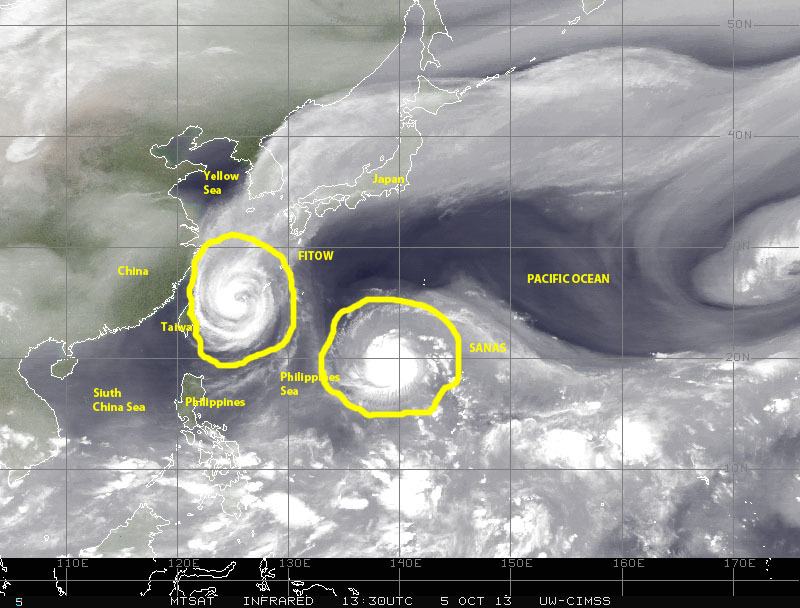 The 2013 season in this basin had generated three tropical cyclones as of today, one hurricane and two tropical storms. On a worldwide basis so far 2013 has seen seventy (70) tropical cyclones generated: 22 in the Northwest Pacific, 13 in the Northeastern Pacific, 3 in the Central Pacific, 1 in the Indian Ocean, 11 in the Atlantic Basin (North of the equator) and another 20 in the southern hemisphere basins (Southern Indian Ocean, South and Southeast Pacific). With 87 days left in the year it would appear 2013 may have a good probability of matching the historical total averaged over the past 50 years. But only Mother Nature knows for sure. In closing, I though it would be interesting to note that 50 or 71.4% of the 70 named tropical cyclones that have been generated worldwide during 2013 so far been in the northern hemisphere. Fifteen of these 50, or 30% have reached hurricane strength, but only 3 of these, all in the Northwestern Pacific basin, or 6% have become major hurricanes (category 3 or higher in the Safir-Simpson scale). In the Atlantic basin there have been only two hurricanes, none of them major, and nine tropical storms. Certainly food for thought for those who say global warming is leading to more intense tropical cyclones. Let us keep monitoring the tropics to see what cyclonic activity is still in store for us in the northern hemisphere basins, above all in the Atlantic Basin that may bring such activity to our shores. Always keep in mind that we must pay attention, be prepared, and above all mitigate!